Jambeaux, everyone!!! Welcome to another episode of the Magic Our Way podcast. We appreciate your listening to our show and we hope it brings a smile to your face. We also appreciate your feedback and are committed to listening to our audience. 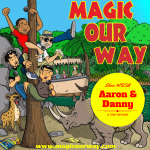 To join them as co-host, Kevin and Danny welcome back Lee of Magical Moments Vacations for this episode. There is no Guest Services or Queue on this particular show because this was recording to be used at a time in which we all couldn’t get together. So, as we had done in the past, this is a Hub show. In the Hub, Lee and Danny discuss the queues of the Walt Disney World Resort. The give you their opinions on the queues that aren’t with the wait or do nothing to serve the story, on the queues that are just so-so for them, and on the queues that absolutely knock-it-out of the park for them. What is your list of queues? Share them at magicourway@gmail.com. 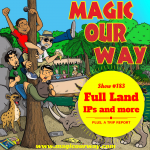 Visit us on our website, www.magicourway.com, and send us a Speakpipe message, email us at magicourway@gmail.com, or call us at 1-844-HARAMBE (1-844-481-8689). We love to hear from any and all of our listeners. Thanks again for listening to us. We do realize that you have many choices when it comes to Disney podcasts and we appreciate your attention. 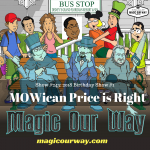 The Magic Our Way Podcast loves the MOWican Tribe.